King Offa’s Dinar – Muslim Museum UK – Uncover the 1400 year relationship between Britain and Islam. Explore the history and heritage of Muslims in Britain. In 773-774 King Offa of Mercia minted a coin that imitated a dinar. It bears the shahadah (Islamic declaration of faith). It is on display at the British Museum. This unique gold coin of Offa, king of Mercia, is one of the most remarkable English coins of the Middle Ages. 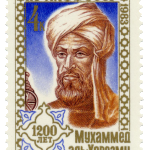 It is remarkable because it imitates a gold dinar of the caliph al-Mansur, ruler of the Islamic Abbasid dynasty. Although the Arabic inscription is not copied perfectly, it is close enough that it is clear that the original from which it was copied was struck in the Islamic year AH 157 (AD 773-74). It seems that the engraver had no understanding of the Arabic script: the name and title OFFA REX has been inserted upside down in relation to the Arabic inscription. The purpose of the coin is uncertain. It has been suggested that it was made as a gift for the pope (it was first recorded in Rome), but it is unlikely that any Christian king would have sent the pope a coin with and inscription stating that ‘there is no God but Allah alone’, however badly the Arabic had been copied. It is more likely that it was designed for use in trade; Islamic gold dinars were the most important coinage in the Mediterranean at the time. 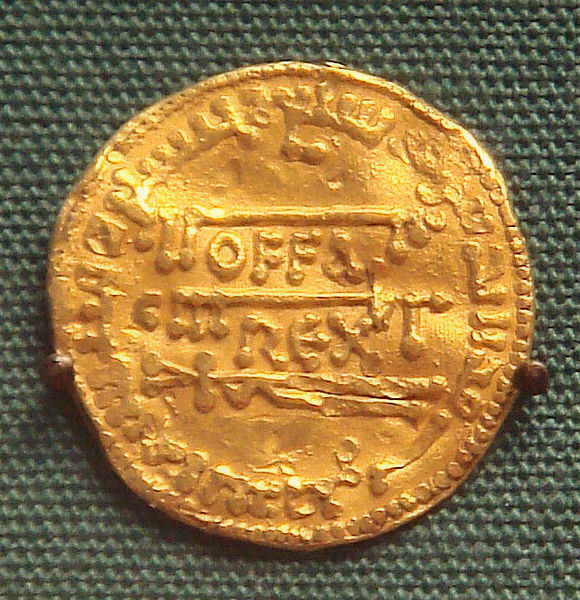 Offa’s coin looked enough like the original that it would be readily accepted in southern Europe, while at the same time his own name was clearly visible.